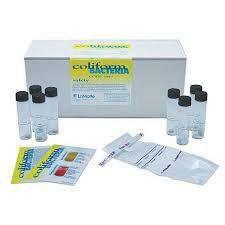 An easy-to-use, disposable tube method that indicates the presence of Total Coliform Bacteria. The water sample is placed in a tube containing a reagent tablet and incubated at room temperature for 48 hours. The tube is then examined for positive indicators of coliform bacteria such as color change and formation of gas bubbles. Each kit contains 44 capped tubes each containing a Coliform Test Tablet, and a set of laminated color chart and instruction flashcards.